Recently single and still holding a grudge? Valentine’s Day dredging up those emotions you’ve been trying to push down? We’ve got the perfect event for you. 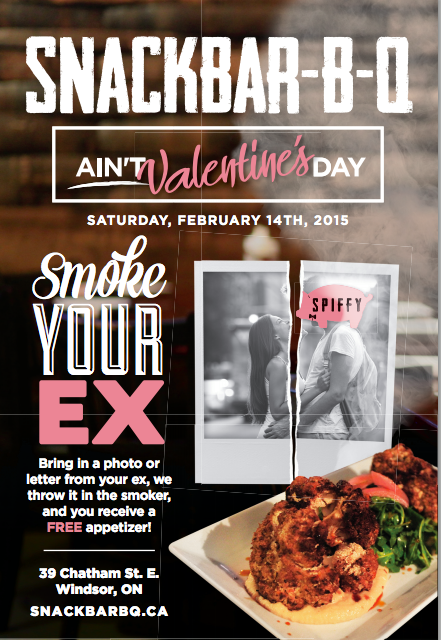 This Valentine’s Day, the folks over at Snack Bar-B-Q are putting a twist on Valentine’s Day for a restaurant and want you to “smoke your ex”. Bring a photo or letter from your ex-lover and receive one choice of three sample portions off their menu: A beef cheek taco, red neck taco or fried green tomato. They’ll then throw your emotional offering into the smoker to set you free. Go on. Let it all out.